I am part of a team looking at educational uses of Second Life in a NZ context. My uncomfortable title in that team is “learning designer”. A significant proportion of this project is to work with 2 subject areas (midwifery and foundation interview skills) and work out ways to use Second Life to enhance learning outcomes for those two topics. This post is an outline of a 3 phase development process we have adopted so far, and a proposed 3 stage production process for each of those 3 phases of development. Through the course of 18 months, the project team will meet face to face 3 times to mark the beginning and the end of each 3 phases. The 3 phases are production steps with risk management built in. The objective for each phase is to design and produce a finished package of educational resources, ready to start extending that with the next phase of development. The 3 development phases lead into one another, but at the end of each phase it is important to have a completed and usable range of resources for that phase. In our first 3 day face to face meeting we held a mini conference on day 1, open to anyone with interest, just to get exposed to ideas and considerations. On the second day the team met with the objective being to come up with an over all idea of what they would do in the project. On the 3rd day the team met again to clearly and precisely articulate what the first phase of production would be, then to articulate with less precision what the second phase would look like, and finally to roughly outline what the ideal 3rd and final phase would be. These 3 directives inform production of phase 1. After that, the media designers and developers set to work producing the first phase over the weeks leading up to phase 2. Production of phase one would be completed by the time the 2nd face to face meeting is held. The 2nd meeting marks the beginning of phase 2. Again, we would hold an open conference on day one, but this time to show the work, gather ideas and feedback and reflect on the process so far. On the second day we would work at refining the over all vision and make adjustments. On the 3rd day we would clearly and precisely articulate phase 2 for the producers, and roughly outline phase 3 for general direction. The 3rd and final meeting marks the end of phase 2 and beginning of phase 3. We do the 3 days again, articulating a precise production plan, and then produce a finished stage 3 over the subsequent weeks. By the end of this process we will either have a fully developed package of educational resources from all 3 phases of production, or – if something goes wrong with budget, team members, and other risks, we will have a completed package of resources from either phase 1 or 2. That outlines the over all process with which we are developing. But what about the specific production process? All things in life come in threes! Within each of the 3 development phases are these 3 production stages, and some of these stages happen simultaneously (for practical reasons) and ideally, most of these stages get done at the face to face meetings. It is also important for each team member to appreciate their roles. I find it useful to think about other production processes like house renovation. There is the house owner who envisages living in the space, their is the draftsperson who helps them turn their magazine cut outs and general ideas into plans, and there are the builders and professionals who rely on those plans to get the job done. This 3 stage production process speaks to each of those equivalent roles. Some people call this the user or background research. The lead educators for each of the topic areas we are developing for should articulate the context in which their colleagues and students come to this resource. Naturally the lead educators and others will want to jump to production ideas, but its important in this first stage that we attempt to take an objective look at the “users” and come to a common understanding of the people who will be using these resources and the context in which they will be using them. The lead educator is in the best position to give us that insight. What are the prevailing attitudes to computers, the Internet and if they have heard of Second Life, and what are their preconceived ideas of all that applied to their education? What might their motivation levels be like? What is their access to computers with the right specs going to be, and what about Internet connection? Will they only be able to access from their school and so their setting will be computer labs under supervision? Or will some have access from home or outside, and want to (and/or be expected to) use the resources independently? What sort’s of supports (if any) will be in place from the school? What sorts of restrictions (if any) might the school have on the Internet and Second Life? What else can you tell us about the context and frame of mind in which key people (especially other teachers) will be approaching these resources? Something that informs the production team of things like this will help with the next stage where we devise a treatment. Some people call this the user narratives. Using the context as a guide, the lead educator and the learning designer work together in articulating an approach and generating ideas, gathering examples, illustrations and other inspiration to help illustrate their ideas. We use this stage to find inspiration and express our ideas in formats we are comfortable in. For example: Sarah, the lead educator for the midwifery development is thinking about the phase 1 development plan. She has articulated the context for this phase and is now looking for inspiration for the birthing unit build as well as the offline resources to compliment that build. Sarah finds a Youtube video of people occupying a space in Second Life that gives her ideas for the build. She embeds that video in her blog and then goes on to describe what she likes and dislikes about the video, identifying objects, spacial design and other things useful to the build of the birthing unit. She also takes photos of venues in Second Life as well as finding photos of real birthing units. All this makes for 1 or several posts that express her ideas for the build. She does the same for possible learning activities and resources. Others are welcome to contribute their ideas in similar ways, either in their own formats, or as comments to Sarah’s blog posts. The learning designer then picks up these ideas and works with the development team to produce precise plans for the production. This information from Sarah is much like the home owner gathering their ideas for the renovations, including where the kids will play, or where the outdoor activities will take place. It is expressed in a format that Sarah is comfortable in, and it is lead by the context she knows well, and her ideas stimulated with input from others. We are not asking Sarah to fill out any matrix or template document, those documents are tools for specialists – much like a draftsperson would use a formula to interpret a home renovator’s ideas into plans for builders. This leads us to stage 3, the production. Some people call this the script or production schedule. Designers and developers use document templates to fill in fields based on their interpretations of the treatments written by the lead educator. Clare Atkins has been working on a document that aims to capture the level of detail a developer would need to create the resources. 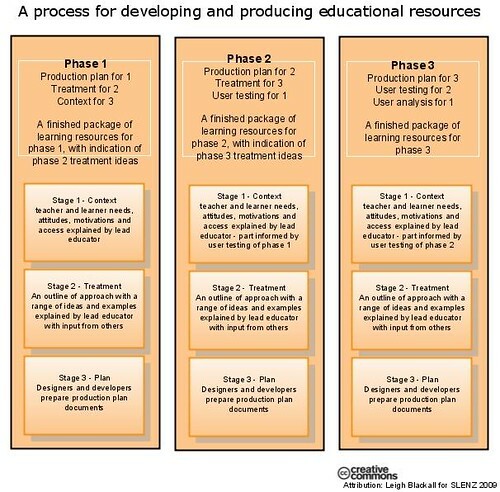 Clare has included in that document elements of the stage 2 treatment as well, but primarily it is a document for this 3rd stage – the production plan. It is important that the lead educator not directly fill in these plans or documents, but that the designers and developers are given a chance to test their understandings from the treatment ideas and gather as much information as they can, extracting missing information from the lead educator and when needed. Ideally they would come up with a draft model in this stage – like a story board perhaps, but practicalities may mean that they simply focus on getting all the information they need so that they may proceed with production. This information and planning stage is a specialist task and results in the final and definitive document that forms the basis of the production. These 3 stages of production preparation are repeated for each 3 phases of development. So there you have it. This process is derived from my experience in documentary video production, and interactive learning resource production. It is an extension from the 3 general development phases the SLENZ team had established so far, and is in response to some work already done by Clare Atkins, Terry Neal, and Tod Cochrane in capturing developmental information, as well as Sarah Stewart’s efforts to provide developmental information in a birthing scenario decision making matrix. In many regards it is very similar to that work that has already started, but it is an attempt to establish an end user centered approach, taking into account a wide contextual basis around those end users and devising learning activities and resources that are in response to that context. It separates the lead educator from the specialist work of production planning, and asks them to focus on what they know and provide ideas in formats they are used to. The final production is largely in response to the lead educator, with the specialist documents not leading or framing the thoughts of the lead educator. Naturally the production team will have opportunities for input into those ideas as they are expressed by the lead educator and others. Sarah’s response with a Context write up.